Roatan (N16.23, W086.22) is the biggest of the Bay Islands in front of the North coast of Honduras. We arrived at Oakridge mid-morning and were guided to a haul-out facility in the back of one of the bays. The sail from the reef had been a smooth one. The bilge pump had been able to keep well ahead of the water inflow. 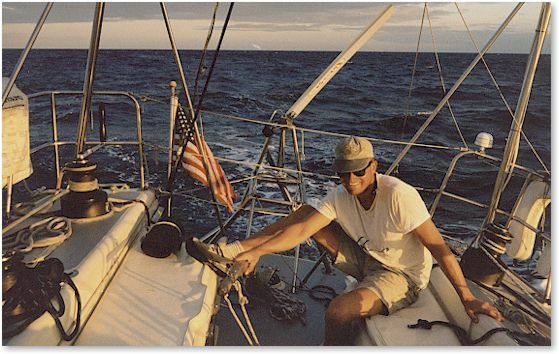 Steve even decided for a couple of hours of spinnaker run. A true highlight of the journey! Just the night had been horrible for both of us. We ran two hour shifts. When not on deck, I tried to catch some sleep in my bunk. While lying there I was constantly listening for unfamiliar noises. Was there a scratching, cracking, water coming in? In addition, I was continuously wondering where we were: Are we heading for another reef? I jumped up twice that night and quickly checked our position just to find out that we were in the middle of a blue ocean. Both of us were glad when the day broke. The rail based system in Oakridge looked more like made for fat shrimp boats and we had our doubts whether our thin lady with her deep keel would fit on the cart. Alberto, the fat man from Nicaragua with Chinese heritage, assured us though that things would work. The catch: We had come in on Friday, and there was no one willing to work over the weekend. Time for us to slow down again. The haul-out was scheduled for Monday. This gave us enough time to find a fiber-glass expert on the island and to make contact with Dave and Donna from the marina across the bay. The two of them turned out to be real supportive friends. We had a wonderful time at the afternoon barbecue at 'The Hole in the Wall', a small sea side restaurant in the next bay, run by former cruisers. On Monday things were not going as predicted by Alberto, Elvis and his gang. The deep fin-keel turned out to be a major problem, as we had expected. After several attempts it became obvious that it was not possible to build up enough side support. Steve stopped the procedure and we motored -not without some shallow problems- to Dave and Donna's marina. There were not too many options to save 'Solitaire'. It turned out that the next real haul-out port would be Puerto Cortez on the mainland, some 100 miles away. We knew that the boat needed to get out of the water as soon as possible. We also knew that it would require some months of work and therefore needed a dry dock to stay on for a while. Hence, it had to be Puerto Cortez and it had to be now. I was hesitant. How much damage did we really find? Would conditions remain stable for another 100 miles. I didn't want to go. Yet, this was not the time to abandon Steve and send him off on his own. 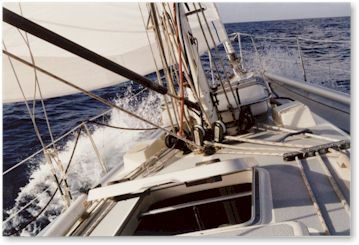 We sailed Monday afternoon, expecting to be in Puerto Cortez the following morning. Dave and Donna agreed on running a radio net with us and monitor our position every two hours - even throughout the night! This gave us a sense of security as we took 'Solitaire' on her final journey as a damaged ship. Up came another night that I'd rather forget. Too many doubts were infiltrating my good intentions. 'Solitaire' though made good progress, slowly leaking and steering a bit funny, but going her way.